Only with Broker/Mentor Al Lewis. 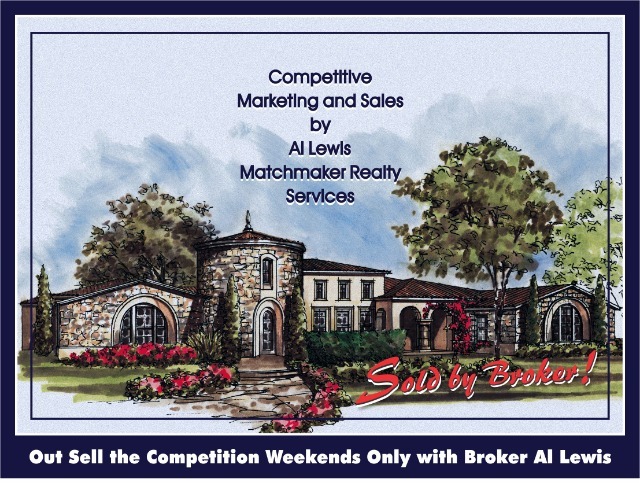 Introduction / The Matchmaker Realty Services - Sales - plan is designed to empower and enable Buyers' Agents to sell anywhere from one-to-fifty houses a year part-time, weekends only if wanted, even though not active Listing Agents themselves turning listings at the rate of one or more a week to do this. (1) Qualified buyers – Buyers that Have Made a Decision to Buy in the Immediate-Present or Near-Future at Market Price and Know where They Intend to Buy – abound at some identifiable rate based on past sales for every neighborhood. A neighborhood, for example, that experienced twelve-sales twelve months past will likely experience the same number of sales twelve months hence irrespective of how many homes actually go up for sale. This level of demand would amount to an average sales rate of one sale every four weeks; twenty-four sales a year would amount to an average sales rate of one sale every two weeks; and so on and so forth. To ensure a level of opportunity is equal to one's ambition within an area or locale within which one wants to work, an agent need merely to grow the area of their focus and efforts from, maybe, a neighborhood to a locale, or a locale to an area, or an area to a region, or a region to a city, or a city to a county, until the math speaks for itself. (2) The first thing a qualified buyer does when they come into the market to buy is drive the locale or area within which they are interested in living to see what’s for sale. It is by their doing this, by their calling on signs or stopping at open houses, that agents (Matchmakers) with in-field buyer-representation programs in place and active are able to meet buyers week-to-week, month-to-month, and sell houses accordingly. (3) Because buyers are drawn, like bears to honey, to neighborhoods within which they want to live to see what’s for sale we can easily gain an opportunity – Often the First Chance – to work with them by conducting attention-getting, incentive based marketing programs such as those of Matchmaker Realty Services. The Only Cost Effective Way to Market for Buyers. The bottom line to listing and selling success is tied to in-field sales and marketing activity and not to how creative we can be at our desks in front of our computers. Waiting for clicks from invisible online customers is like waiting for the phone to ring; no way at all to build and grow a business. To increase and sustain productivity for just about every agent in real estate a shift in thinking, training, and programs offered by real estate companies is needed that puts them back on the street, into neighborhoods, in front of buyers and sellers in the suburbs where business is found and transacted. That is the Mission of Matchmaker Realty Services / We all – Brokers, Agents, Teams, and Companies – can increase our profitability many times over by establishing or reestablishing street-smart listing and sales programs oriented to the customer; online marketing, invaluable and productive as it is, follows. It is my mission to help all in our business that I work with gain advantage over the competition by employing one or more of the proprietary sales and marketing programs we at Matchmaker Realty Services bring to the table. Is a Name Just an Arbitrary Label? Very often the first bit of information we have about a person or company is their name and by it form judgments about them very quickly. These judgments can lean to the positive or the negative and this first impression can set the stage for all future interactions. What, after all, does Keller Williams, Coldwell Banker or Sotheby's mean to a buyer; or First Team, Berkshire Hathaway or Engle & Volkers; or Re/Max, ERA or Windermere; or Century 21? A seller may have a predisposition to working with one or the other for one reason or another, but a buyer's needs are not tied to a single one. This has some interesting implications; most important among them is that an agent that wants to establish a fast-moving buyer-representation program do this in a way not tied to the company they work with, but in a way that hits-the-nail-on-the-head, so to speak, relative to a buyer's most pressing need the moment it arises. That need, we all know, is a want: a want to see all homes available within the vicinity of their desire the very day and time they drive into it. Buying is impulse driven and Matchmaker Real Estate, by both name and stated purpose is the hammer that hits-the-nail-on-the-head, clean and square. “What's in a name? That which we call a rose by any other name would smell as sweet,” said Juliet to Romeo (Shakespeare, of course). Here Juliet tells Romeo (Montague) that a name is an artificial and meaningless convention and that she loves the "Person" who is called Romeo, and not the Montague name. That may be true of Juliet and her feelings for Romeo, but this is definitely not true in business and, particularly, the marketing of a business. In business a “Rose” called by another name is a thorn and nothing more. To a buyer, Keller Williams, Re/Max, Berkshire Hathaway, etc. are all thorns. The “Matchmaker” moniker and promise as defined on both the participant's personalized Marketing Card and In-Field Sign are self-fulfilling prophecies for both buyer and agent alike; and, most important, cause the phone to ring. There is a term called “Nominative Determinism” which is a theory that a company's name has a demonstrative influence over that which occurs in its business: that people gravitate to both a company and a person working for a company with a name befitting their needs. If you work with a franchise company or any such company that hosts a generic name, all is well, I say, if your main objective is the gaining of listings among a clientele you have long nurtured by relationship-building activities; but if you want to market for buyers, grab the brass ring so-to-speak and either "Associate" or "Affiliate" with Matchmaker Realty Services to do it, Now! Matchmaker Real Estate by Al Lewis. At this point you might be asking yourself how this is possible; how you can build a career and grow wealth in real estate working part-time, weekends only, without joining a franchise organization and doing the things they tell you to do; how this can be done nearly cost free and within only a few days of starting? The answers are found within a program introduction, job description and start-up pro forma titled "Matchmaker Real Estate by Al Lewis." To get this, call Al Lewis direct at 714-744-0617, or request by eMail at AlLewisMarketing@gmail.com. Talent and skill you have in abundance, I can assume this, but they must be channeled to be of value in the marketplace. To soar listing "and Selling" real estate you have to have a story that makes you interesting, not a run-of-the-mill franchise rubber stamp, but a standout persona that satisfies the demands of what every buyer thinks of as a high-level selling situation worth paying attention to, whatever their price. In affiliation with "Matchmaker Realty Services" you will have this. You are a concerto in the making, a large scale musical composition for a solo instrument accompanied by an orchestra, play your music and be recognized. One place or another in my writings you may have read the statement,"Though stated as a job, real estate is not actually a job at all, it is an activity. Specific activities produce specific results." It is not important whether you work only a few hours a week, twenty-to-forty hours a week, or more. What matters is what you do when you work. I have mainly referenced this relative to Listing activities; the Matchmaker"Weekend Warrior Sales Program," however, like the"Weekend Warrior Listing Program," is a correlative expression of this principle: it is a means by which you invite yourself to the party, part-time, weekends only, Saturday or Sunday or both, when wanted. Introductory Meeting / To learn exactly (1) How the Matchmaker Realty Services program works (2) To determine your fit (3) To learn why it is recession-proof, free of competition and the "Top Job" in real estate you are cordially invited to call on broker/mentor Al Lewis any time for an introductory conversation that will lead to an introductory/signup meeting. Al Lewis -- Marketing Professional Since 1975 -- is the Principal of Real Estate Professionals World Enterprise Marketing, an independent, standalone advertising agency serving the needs of real estate oriented sales professionals, owners and sellers throughout home state, California, the US, and numerous International markets; and Broker of Real Estate Professionals Allstate Marketing and Matchmaker Realty Services, each a real estate company licensed with the California Dept. of Real Estate, License No. 00524259. All are headquartered in Orange County.